Due to your incredibly generous donations, we are no longer taking donations for this family. But there are many other families in need - if you would like to donate (or encourage others to!) please direct funds to our other families in need, or our general fund found at ImmigrantFamiliesTogether.com Thank you, again, for your generous donations and contributing to changing this family’s life. Immigrant Families Together is a movement to help reunite detained parents with their children. With grassroots effort and community donations, we have successfully bonded out Yeni Gonzalez and she's held her kids again ( https://nyti.ms/2lRD7jy). We have been able to do the same for several other families - you can read more about us and our success stories here: https://immigrantfamiliestogether.com/press. However, there is unfortunately a long line of families waiting desperately to be together again. Norma is the 13th mother we are helping, and is currently detained at an ICE facility in Arizona. She is separated from her 3 children (ages 4, 8, and 10.) Thankfully, the children are with a family member, but are still in another state, and the separation is still very difficult for all of them. Norma CAN be reunited with her children and we're determined to help her, working in conjunction with her attorney, to reunite them. 1. Raising of bond funds through coordinated crowdfunding and individual giving in order to post bond for parents separated from their children at the US/Mexico Border. 3. Arranging safe transportation from state of detention to the city where children are currently in foster care. We will be paying Norma’s expenses related to her release, transport from Arizona to the state where her children are, and paying for her accommodations, food, cell phone, and other expenses, as well as providing her with support to attend appointments and reunite with her child. We are not related to Norma or her attorney by blood. 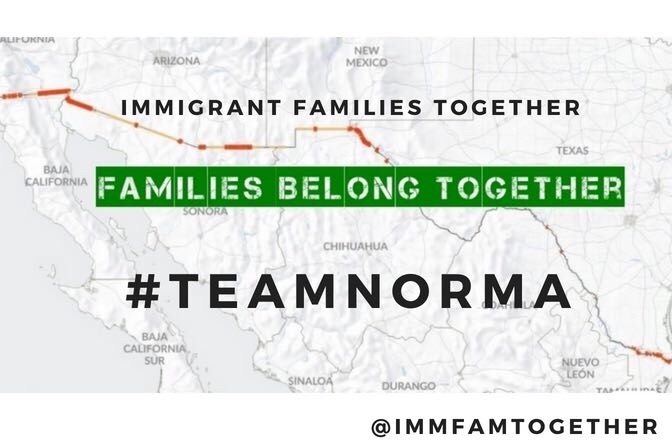 We are a community of concerned parents and citizens who don't support the current separation policy and want to do our part to reunify Norma with her children. We will withdraw all donated funds to Julie, the leader/organizer/founder of Immigrant Families Together. They will then be transferred to her attorney or Norma. Expenses to be paid include: Expenses related to release, transportation from Eloy, Arizona, lodging, food, local transportation, cell-phone, and other expenses Norma may incur as part of her reunification, including but not limited to costs of preparing for her court appearances (copies of documents, etc). Immigrant Families Together (Familias de Inmigrantes Unidas) es un movimiento para ayudar a reunir a los padres que han sido detenidos con sus respectivos hijos. Con el esfuerzo como base y las donaciones de la comunidad, logramos reunir exitosamente a Yeni González y ella ha vuelto a estar nuevamente con sus hijos ( https://nyti.ms/2lRD7jy). Hemos podido hacer lo mismo con muchas otras familias. Puede leer más sobre nosotros y nuestras historias de éxito aquí: https://immigrantfamiliestogether.com/press. Sin embargo, y desafortunadamente, hay una larga lista de familias que esperan desesperadamente estar nuevamente juntas. Norma es la decimotercera madre a la que ayudamos, y actualmente se encuentra detenida en las instalaciones de la ICE en Arizona. Ella está separada de sus 3 hijos (de 4, 8 y 10 años). Afortunadamente, los niños están con un familiar, pero aún están en otro estado, y la separación sigue siendo muy difícil para todos ellos. Estamos seguros que Norma PUEDE reunirse con sus hijos y por ello estamos decididos a ayudarla, trabajando en conjunto con su abogado, para que puedan volver a estar juntos. 8. Proporcionar fondos de sostén para la familia mientras se aborda su caso de inmigración, de acuerdo con las pautas federales de pobreza, ya que estas mujeres no pueden buscar trabajo legalmente durante al menos 5 meses. No tenemos relación de sangre con Norma o con su abogado. Somos una comunidad de padres preocupados que no apoyamos la póliza de separar familias al cruzar la frontera. Los fondos serán retirados por la fundadora de Familias Inmigrantes Reunidas Julie Schwietert Collazo. Los fondos serán transferidos al abogado de Norma. Los gastos por pagar incluyen: gastos relacionados a su liberación, transporte de Eloy Arizona, alojamiento, alimento, transporte local, celular y otros gastos necesarios para la reunión de Norma con sus hijos. Además de pagar gastos legales para la preparación de su caso ante el juez. Due to your kindness and generosity, Norma has been released from detention and reunited with her children. She is so grateful for all you have done for her. Like many of us, she is now turning her attention to getting her children enrolled in school and prepared for the upcoming school year (like many of us!). She is also focusing on getting them medical care, and working with her lawyer to stay on top of her court dates and legal case - she is determined to see out this legal process. You have made all this possible, and you have no idea what that has meant to this family.